A ship in the British navy came to the aid of a stranded cruise ship in the Antarctic last week, helping to clear a path through the ice that had entrapped the civilian vessel. While no one was injured and the entire operation took just a few hours to complete, the incident underscores the challenges of traveling in the Southern Ocean, even in the 21st century. The ice-breaking vessel HMS Protector was on a regular patrol route off the coast of Antarctica, with the Norwegian cruise liner Fram following close behind. The cruise ship had hoped to safely follow the Protector through the icy waters that were dense with ice floes at the time. But before the boat could navigate out of the perilous region, the large chunks of ice moved in, completely encircling the vessel and preventing it from moving forward or backward. A quick call to the Protector alerted the first ship of the situation, bringing it quickly around to render aid. It took the icebreaker two hours to crack through the 13-foot-thick ice that had encircled the cruise liner, before it was free to continue its voyage. The passengers aboard the Fram were fortunate that the Protector was so close at hand or they could have been held in place for much longer. Considering the size of the Southern Ocean and the relatively few vessels in those waters, it could have been hours or even days before another ship could have come to assist. Similarly, had the Protector not been an icebreaker it wouldn’t have been able to lend a hand either. The Norwegian cruise liner was never in any real danger, but ships running into problems off of Antarctica are a fairly common affair. Back in 2007, the cruise ship MV Explorer sank off the coast of the frozen continent and in 2010 another ship ran into trouble when it lost an engine while crossing the perilous Drake Passage. In 2011, a third ship ran aground on rocks near the Antarctic Peninsula, breaching its hull in the process. In each case, all passengers were evacuated safely from these vessels but some travel experts believe that it is only a matter of time before a tragic accident occurs. After writing this story I heard from Steve Wellmeier, the Administrative Director of the International Association of Antarctic Tour Operators (IAATO) who filled in a lot more information of what was happening when the Fram became stuck in the ice. In seems the cruise ship was hoping to make a regularly scheduled stop at Brown Bluff, their scheduled destination for the day, but due to high concentrations of ice in the area, it didn’t seem likely that they would reach that point. The Protector was already heading to the same location and invited the Fram to follow along. The two ships then proceeded to Brown Bluff as scheduled, with passengers from both vessels going ashore. Later, as both ships were making their way back to open water, the Protector once again took the lead and proceeded ahead. At one point they reached an area of pack ice that was thicker than what they had encountered previously, so the Fram stopped to let the icebreaker do her job. While the Protector nosed ahead, the dense ice moved in quickly around the cruise liner, preventing her from moving forward and trapping her in place. Realizing what had happened, the Protector then came around and cleared the ice quickly and efficiently from the path of the Fram, freeing her to continue her voyage. We’re told that this was not a rescue per se, but rather a routine assistance of one ship to another, without danger to either vessel or anyone aboard. It is good to get the full story directly from a source that knows the logistics of what was happening in the Antarctic. The IAATO, and its members, work hard to ensure that travel in that part of the world is safe for both passengers and the environment. Their efforts make it possible for those of us who want to go to Antarctica to actually do so. Lindblad Expeditions is kicking off 2013 with an excellent deal for travelers planning a visit to Antarctica and the surrounding region later this year. The adventure travel company, which specializes in adventure cruises to some of the most spectacular destinations on the planet, is offering free airfare for anyone who signs up for their November cruise to the frozen continent. That 24-day trip includes stops not only in the Antarctic, but also the Falkland Islands and South Georgia as well. Travelers will depart the U.S. for Ushuaia, Argentina, on November 7 before setting sail aboard the National Geographic Explorer, a ship specifically outfitted for safe travel in the Southern Ocean. Over the course of the following three weeks, they’ll spend four days visiting the Antarctic continent itself as well as two days in the Falklands and five days on South Georgia. The remainder of the itinerary is spent at sea traveling between those destinations. While aboard the ship, passengers will be able to attend lectures given by a variety of specialists, including legendary oceanographer and Honorary President of the Explorers Club Don Walsh. A National Geographic photographer will also be aboard, capturing stunning images from the journey and travelers will even be able to take advantage of a special documentary film workshop. Given by Nat Geo photographer and filmmaker Cotton Coulson and David Wright, that workshop will provide instruction on how to make their own personal documentary of the voyage. Anyone who registers for the November 7 departure between now and March 31 will receive complimentary airfare for the trip. Additionally, travelers who sign up for either the November 27 or December 7 departure of Lindblad’s shorter 14-day White Continent itinerary will also get free airfare for either of those voyages as well. 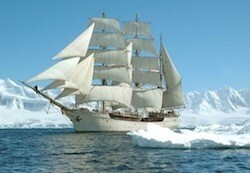 If you’ve always wanted to visit Antarctica, 2013 could be the year that you make that dream come true. The International Association of Antarctic Tour Operators (IAATO) is predicting an increase in Antarctic tourism this year as adventurous travelers begin to return to the frozen continent in larger numbers. If that prediction holds true it will be the first time in four years that Antarctica will see an increase in visitors, which is good news for travel companies that operate in the region but could spell an end to the fantastic discounts that we’ve enjoyed over the past few years. The IAATO says that during the 2011-2012 season, which ended in April, its members carried 26,519 passengers to Antarctica. This year it is predicting that the number of travelers will increase to 34,950, which is still well below the record high of 46,265 visitors set during the 2007-2008 season. The following year marked the start of the global economic downturn from which many countries are still struggling to recover. Additionally, a 2010 ban on ships that use heavy fuel oils has helped to reduce capacity to the Southern Ocean as well. Both of those factors are believed to have contributed to the sharp decline. While the number of visitors to the Antarctic has steadily dropped over the past three years, travelers have been able to take advantage of the situation and visit the continent at bargain prices. A number of high-profile tour operators have offered substantial discounts, and even “two for one” specials, to help fill their cruise ships. Now that demand appears to be on the rise again, those of us who have always wanted to visit the Antarctic may have missed our opportunity. Alternatively, if you do come across a good discount for the 2012-2013 season, you just may want to grab it. Watching whales leap out of the water is one of many opportunities travelers have when visiting Antarctica, as an increasing number of people worldwide are looking to explore the bottom of the earth. Student groups, individuals and families are frequently heading south on an Antarctica adventure that many only dreamed of just a few years ago. Recently, a group of Michigan State University study abroad students on an expedition in Antarctica found their boat stuck on ice and stranded, but not for too long. The frozen tundra of Antarctica has become a hot spot for ecotourism, too. Thirteen MSU students participated in the expedition in Antarctica program a few months ago. “Not any two people have the same short list of reasons for going – the love of adventure and (being) off the routine path of MSU are some reasons why,” said Michael Gottfried, an associate professor of geological sciences in a State News article. But the increasing amount of travelers visiting the continent could have consequences. Students are told to wash their boots and not to take anything because it changes the environment. Although many nations conduct climate and other scientific research in Antarctica, the MSU trip isn’t based solely on science, Gottfried said. Students in dance, journalism, engineering and other majors have taken the trip not just to explore wildlife, but also to learn about the physical and biological aspects of the area. “People underestimate the pristine quality of this beautiful place,” Campbell said. National Geographic Expeditions does a 14- or 24-day Journey to Antarctica aboard the National Geographic Explorer that hits the Antarctic Peninsula and the surrounding islands and waterways. Journeys International has a 12-day Active Antarctica Adventure that allows those along for the ride to test their endurance with an average of two, off-ship activities each day, including camping, kayaking, mountaineering and cross-country skiing while appreciating the penguins, whales and icy landscapes. Abercrombie and Kent sails the whale-rich waters of the Drake Passage to the Antarctic Peninsula’s bleach-white, remote coastlines on a comprehensive expedition cruise that reveals the many faces of the world’s last frontier. This one lets us go behind the scenes of an environmental research station and chat with on-board experts nightly about the day’s discoveries. Students On Ice is an award-winning organization offering expeditions to the Antarctic to provide students, educators and scientists from around the world with inspiring educational opportunities at the ends of the Earth. This video gives us an idea of what Students On Ice is all about. A visit to Antarctica is high on the list of “must see” places for travelers looking to get off the beaten path. It is the highest, coldest, driest continent on the planet, and yet it still holds an undeniable allure for many adventure seekers. They come to kayak amongst the massive ice flows, visit penguin colonies, and to step foot in a place that few people ever get to see. This year, a few lucky visitors will also get the opportunity to witness a solar eclipse. On November 25th, a partial solar eclipse will take place in the southernmost regions of the planet, making it only visible in New Zealand and the Antarctic. While the kiwis will have just 20% of the sun obscured from view, the Antarctic Peninsula will see nearly 90% of our star blocked from sight as the moon passes in front of it. Anyone traveling through the region on that day is sure to have a once in a lifetime experience. Adventure travel specialists Quark Expeditions is not only preparing for the impending Antarctic cruise season, which begins in November, they’re currently offering a 15% discounts on all of their cruises scheduled to take place during the eclipse. The company has two different itineraries available and four separate cruises that will be in the Antarctic when the celestial event takes place. It isn’t often that you know that a travel experience is going to be truly unique and special before you even go. But I’d say witnessing a solar eclipse over the Antarctic Peninsula ranks as an unforgettable sight.